The Cannes Film Festival & Market have become a major date in the Irish film production diary in recent years. Over 27 projects are in attendance at this year’s festival in search of worldwide distribution representation and sales at the Cannes Marketplace, while IFB funded projects ‘Black 47’ by Lance Daly and David Gleeson’s thriller ‘Don’t Go’ are set to feature in the film festival itself after earning coveted screenings. ‘Black 47’, a revenge western set during the Great Irish Famine, stars Hugo Weaving (‘Hacksaw Ridge’, ‘The Matrix’), Jim Broadbent, (Oscar® winner for ‘Iris’), and the prolific Irish screen and stage actor Stephen Rea (‘The Crying Game’, ‘Michael Collins’). The film follows a hardened Irish ranger who returns home from fighting for the British Army abroad, only to find his family has perished at the hands of the brutal British rule in Ireland. With little else to live for, he sets off on a destructive path to avenge his family. ‘Don’t Go’ tells the story of a bereft dad who begins to believe he can resurrect his daughter who has recently passed following a recurring dream. The film stars Stephen Dorff (‘Blade’, ‘Imortals’), Melissa George (‘Hme & Away’, ‘Hunted’), Simon Delaney (‘This Must Be The Place’, Delivery Man’), and Aoibhinn McGinnity (‘Quarry, ‘Love/Hate’). 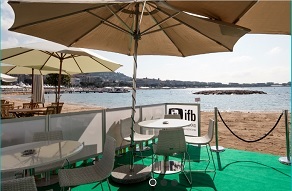 Irish industry members attending Cannes are encouraged to register with the IFB’s ‘Irish Pavilion’, which supplies a central hub for Irish productions screening or selling at the festival as well as providing business, information or social elements to festival and market attendees. The Pavilion will be located at No. 131 in the International Village. IFB funded projects that will be selling at Cannes and will feature at The Pavilion this year include: Sophie Hyde’s ‘Animals’, Hugh O’Connor’s ‘Metal Heart’, John Butlers’ ‘Papi Chulo’, Lee Cronin’s ‘The Hole in the Ground’, Alexandra McGuiness’ ‘Highway’, and Andy Quirke’s comedy ‘Damo & Ivor’. Another film that is currently still in production but will be selling under the IFB slate at this year’s festival is Fastnet Films’ Vivarium’, which is directed by Lorcan Finnegan and produced by Garet Shanley. A full list of projects selling at Cannes can be found below. The Film Board are also set to host a ‘Women & Hollywood’ event on May 14th, which is set to focus on the next steps needed to help the film industry in its fight for inclusion and equality. The event will be hosted by IFB Chairwomen, Annie Doona, and feature panellist Annabelle Sheehan (New Zealand Film Commission), Iris Zappe-Heller (Austrian Film Institute), and Lizzie Francke (BFI). “At this year’s Cannes Film Festival, the IFB is also celebrating the female film-makers who play a vital role in making Irish film what it is today. Among the artwork decorating the pavilion is a special feature wall, entitled ‘Women and Film, Ireland’, which captures and illustrates just some of the incredible talent — both in front of and behind the camera — working in Ireland today. The 2018 Cannes Film Festival runs from May 8th – May 19th, while the Film Market ends two days earlier on May 17th.